TARA Labs, Inc. has just announced the introduction of its Generation 3 Rectangular Solid Core® conductor, to be used exclusively in its state-of-the-art interconnect cables. TARA Labs claims that the Gen 3 conductor has an increased bandwidth or high-frequency extension that makes it unrivalled in important test measurements and listening tests. TARA Labs’ Vice President of Product Design, Matthew Bond, said that the new Gen 3 conductor has the same current-carrying capability of a 28 gauge conductor but has the high frequency linearity of a 40 gauge conductor. Matthew Bond explains why this is possible. “In a conductor with a rectangular profile, there is a huge reduction of ‘flux-linkage’ or ‘coupling’ of electromagnetic lines of force. These lines of force are created as the signal (music) passes through any conductor.” Bond said further, “In a round conductor there is a large center that tends to roll-off or attenuate much more of the high frequency information … this does not happen in a Rectangular Solid Core® conductor”. According to Matthew Bond, the new Gen 3 Rectangular Solid Core® conductor is smaller than the current Gen 2 conductor used in most of TARA Labs’ audio cables. Bond says that the Gen 3 conductor is about 66% of the size of the Gen 2 conductor, and that it is Super-Annealed™ to increase its conductivity. Both the Gen 2 conductor and the smaller Gen 3 conductor are said to be Eight-Nines™ pure copper, which is 99.999999% pure. TARA Labs’ trademarks for this technology are 8N™ and SA-OF8N ®. SA-OF8N means Super Annealed – Oxygen Free 8 Nines copper. According to Bond, the term ‘annealing’ refers to the method whereby a conductor can be made softer and more conductive. Newly designed, exclusive Generation 3 conductors for transfer of delicate high frequency information and fine detail. Only available in Grandmaster Evolution Interconnect. Large diameter Interconnect designed to reduce shield to conductor Capacitance for lowest possible noise floor and contrast of micro-detail and micro-dynamics. Includes connection adapters for limited connector spacing on rear of some system components. In 1998, TARA Labs began the project that would lead to the introduction of the most extreme audio cable, the TARA Labs ZERO Interconnect. In the years that followed the ZERO Interconnect received the highest praise from reviewers all over the world. Now, the new Evolution Series from TARA Labs is truly beyond belief. It is quite simply the new watershed in the art and science of audio cable design. The Evolution Series is in a class of its own, beyond all other audio cable products in the history of the audio industry worldwide. The ZERO Evolution Interconnect uses a new extruded air-tube concept invented by TARA Labs. This new air-tube concept is similar to that used in the ZERO Interconnects and the AIR Series Interconnects originally developed in 1986. However, the ZERO Evolution Interconnect is remarkably flexible. The Rectangular Solid Core® conductors are soft-annealed, eight-nines copper. They are polished by hand in Ashland Oregon, and fitted into the small holes, or galleries that run the length of the interconnect cable. The conductors are coated with a proprietary liquid that prevents any oxidation of the conductor. As with the ZERO Gold, the TARA Labs ZERO Evolution Interconnect comes with a limited Life-Time warranty. Note that no ZERO Gold Interconnects have ever been returned for product failure. The ZERO Evolution Interconnect uses the same displaced and Floating Shield design together with an HFX Ground system for the absorption of RF/EMI, and a vanishingly low background noise. Incredibly, the new ZERO Evolution Interconnect boasts a remarkably low capacitance figure of just 2.5 pF per foot (Conductor to conductor). So, if you do the math, the new Evolution Interconnect has a High Frequency bandwidth that is more than 300% greater than any other high-end cable manufacturer in the world. The results are phenomenal! No audio interconnect in history has achieved this level of performance. You can expect to hear greater dynamic contrast, resolution of fine detail and a more lifelike reproduction than ever before. The new Zero Evolution is another remarkable breakthrough in cutting edge technology and design from TARA Labs. The Zero Evolution design supersedes the Zero Gold with a 75% increase in bandwidth, in addition to an incredible 2.5pf, resulting in a vanishingly low noise floor that creates the widest dynamic range possible. Our SA-OF8N 99.999999% inline polished conductors uses our new proprietary Liquid-film™ dielectric. The Zero Evolution also includes our new flexible air-tube technology and design. This results in a sound that reveals fine nuances of attack, sustain and delay, and is extremely revealing of subtle high-frequency detail. The listening experience is described as holographic and lifelike. The Grandmaster Evolution Series from TARA Labs is truly beyond belief. It is quite simply the new watershed in the art and science of audio cable design. The Evolution Series is in a class of its own, beyond all other audio cable products in the history of the audio industry worldwide. 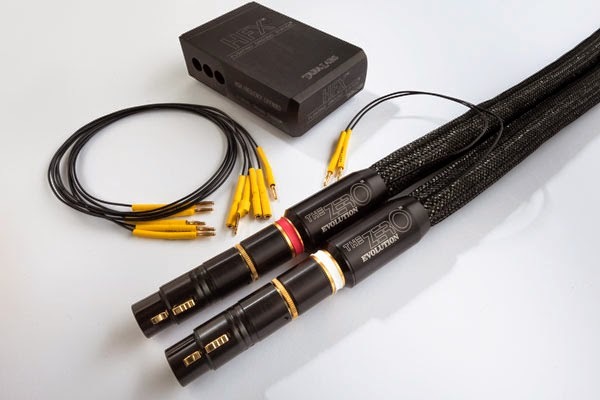 The Grandmaster Evolution Interconnect uses the same multi-lumen air-tube concept invented by TARA Labs as used in the ZERO Interconnects and the AIR Series Interconnects originally developed in 1986. However, the Evolution Interconnect is remarkably flexible. The Evolution Interconnect uses the same displaced and Floating Shield design together with a new Dual Mono-Block HFX Ground system with greater absorption of RF/EMI and a vanishingly low background noise. Incredibly, the new Grandmaster Evolution Interconnect boasts a remarkably low capacitance figure of just 2 pF per foot. This means that the new Evolution has a High Frequency bandwidth that is more than 300% greater than any other high-end cable in the world. Compared to the Zero Evolution, The Grandmaster Evolution has a larger, more complex system of Teflon and Aero-PE filaments that ensure a complete air dielectric system. 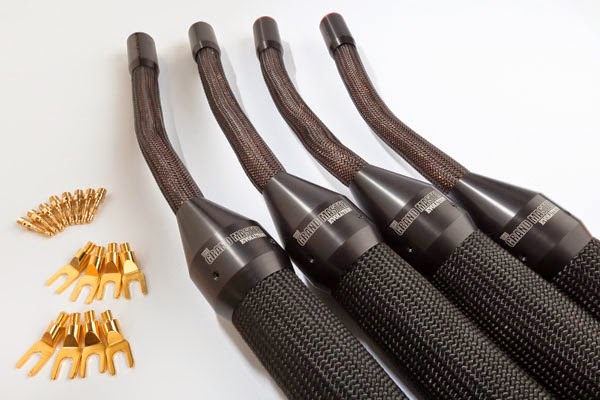 The new Evolution speaker cable is a stunning achievement, boasting the greatest current-carrying capability of any speaker cable in the world, together with the High Frequency extension and linearity of a 32-gauge conductor. The Evolution Speaker Cable is an all air-dielectric design with 288 Rectangular Solid Core ® conductors per channel. Importantly, the gauge size for each channel is far greater than any speaker cable ever made or ever conceived in history. The gauge size is not 10, or 6, or 4, or even 0. The gage size for an Evolution Speaker Cable is 000, that’s an area of 85 square millimeters per channel. Separate positive and negative conductor run for each channel. Spectacular power and clarity. Absolutely neutral and coherent. Superb resolution of micro-detail and ambient information.